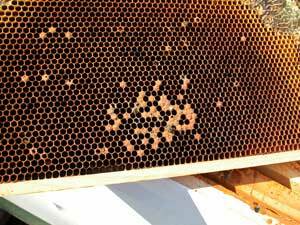 Today was the day to go through the hive at the Mill which died, and to try to face up to mistakes made and lessons learned concerning why honeybees die. The photo here is meant to be sad: these two sisters died facing each other, in the home where they were born, maybe a couple of months ago. These bees never got to see summer, and probably only got to visit the few flowers that appeared, as confounded as themselves by this unseasonable Winter. This page has thumbnail pictures of what we saw as we went through the hive, accompanied by our explanations of the evidence we found there. You can click the thumbnails to see a larger view, and perhaps to make up your own mind. The things you will not be able to see are the food (fondant, and some sugar syrup) that were placed above the cluster and removed when the colony was found to be dead, and the empty bottom box and bottom board. There were very few dead bees in these locations, indicating that many bees died outside and that the dwindling survivor bees were cleaning the hive right up until their last, cold night. At the left you can see the first piece of evidence: a part of the bottom board cover holding thousands of dropped Varroa mites. 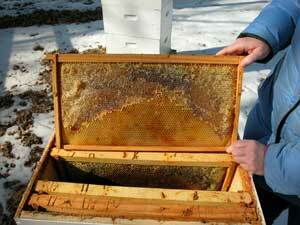 The top box of the hive contained the last of the honey stores, and was the ultimate destination of the clustered winter honeybees as they ate their way upward. The very outside frame, on the shadiest side of the box, was — as expected 738212; empty drawn comb. 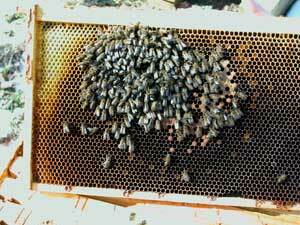 Bees only get that last frame filled at times of maximum nectar flow. 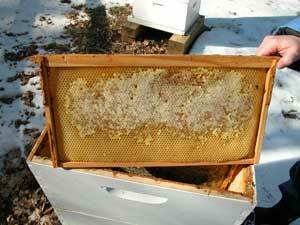 On the other side of the same frame, however (second thumbnail) there was a decent amount of honey, still in storage. 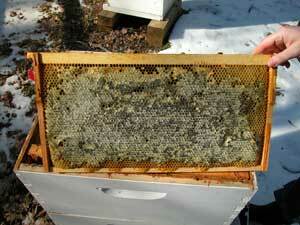 This food would be relatively remote from a winter cluster of bees, however, so it might not be much help. It's a good sign, however, that they went into winter pretty loaded with stores. The trend continues with the second frame in: more honey stores. 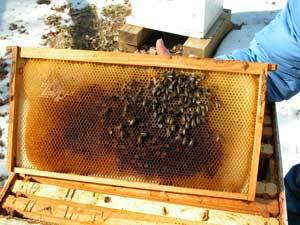 There is probably 5 pounds of honey on this frame, and it is nice that there is more as you head toward the sunny side of the box, where the bees cluster in the Winter. It's nice light honey, too, compared with what was harvested earlier. This stuff is probably made up mostly of sugar water the bees received during all those autumn feedings. 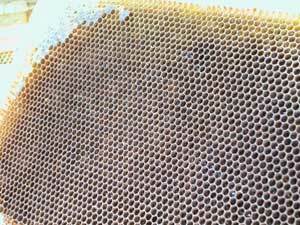 Frame 3 was packed with stores, and you can see that there is dark honey here. It came from nectar that the girls collected themselves, maybe during those times when we just watched them going back and forth. They tended to fly out and up-up-up. 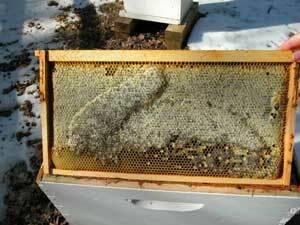 You can see that they made some "art comb" here, which means that the nectar flow was not all that strong. When the flower juice is flooding in, they tend to straighten up and build flatter combs. At the bottom of the second thumb, you can see that the edge of the cluster of bees had risen high enough to begin nibbling the edges. 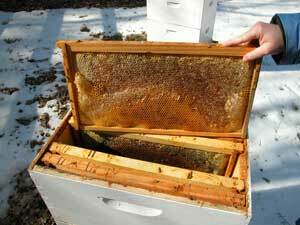 Frame 4 shows that we are getting closer to where the heart of the wintering cluster of bees managed to rise. At one point, there was a big enough ball of bees to stretch all the way through this frame, consuming honey. Once again, note the dark local-nectar honey at the top. This is comforting to me, as it means I did not take too much from them. I think. 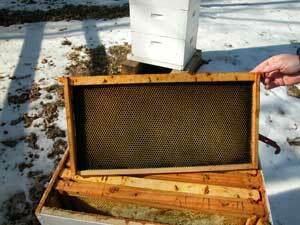 On Frame 5, the cluster has reached the top of the frame, with just a little honey on the sides. You can see a little brood on side one, babies they had to abandon. 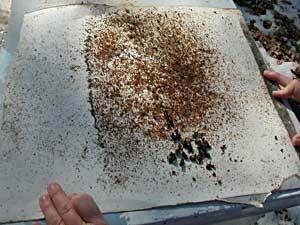 It was important for us to take a look at these larvae in order to determine the cause of the dwindling. Yes, we were worried about American Foul Brood. When we pulled the young from the cells, however, they were either too far along to have had foul brood, or had no wings at all: evidence that paralytic mite syndrome played a role in this collapse. At right, you see the first part of the final cluster that froze. If you take a look, they do not have their heads stuck into cells (for the most part), indicating that they were not starving. Frame 6, side one is where we found Queen Maude, among the greater part of her last, surviving daughters. There are maybe 300 bees here: they did not stand a chance of keeping warm. Once again, their heads are not stuck in cells, and in this case the cells were full of uncapped nectar. This is food ready for eating (honey actually has to be opened and rehydrated to become bee food). They worked so hard to come to this. The rest of the frames were a bit like Frame 8 here, filled with nectar except for the very outer frame, which was empty. When we poked around in the next box down, we continued to check the dead larvae for diseases that could have contributed to the collapse. 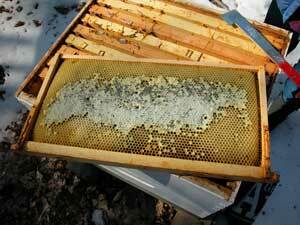 In the case of the photo at right, we found chalk brood, a fungal infection that tends to infect weakened hives. 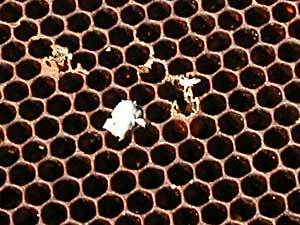 Healthy bees seem to be able to clean this one away: it usually signals a problem, rather than representing one. 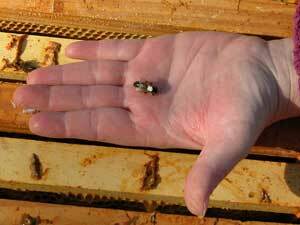 We also dug out a shiny black, hairless bee, a sign of another viral ill that faces beleaguered bees. My conclusion is that this colony grew sicker and sicker as the mite infestation grew larger and larger. 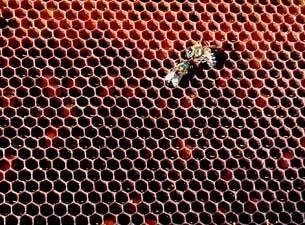 Bees were dying faster than they could be born, and were even failing to hatch. When the cold snap came, death came for the bees who remained, because there were no longer enough of them to stay warm. Here is a picture of Queen Maude, still very beautiful: I kept expecting her to move. I may have made some errors in feeding: by continuing to offer sugar syrup into January, I may have caused the girls to fill up cells in the cluster area with liquid that would later prove difficult to warm. Yet, there were so few bee bodies left in the hive that it seems unlikely that the presence of too much liquid caused a sudden die-off. 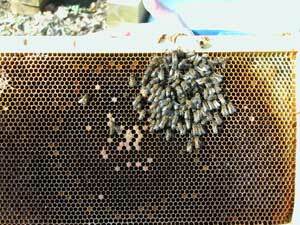 These bees were treated for mites over and over: it may have been a blessing that their mite population passed along with them, since the latter were tough little bugs and it might have been a mistake to risk exposing other bees to this potentially resistant strain. As it stands, I plan to take the honey (NOT give it to other bees) scrape the frames to make the wax into soap, throw the empty frames away, and scorch the insides of the woodenware with my blow torch. Then, my friends, we will start over.